Larry Nemecek “Dr. Trek” returns to talk some Star Trek with Aaron and David. About five weeks ago Larry started his new Star Trek Podcast the Trek Files and he gives us the low down on his new show. We discuss the current state of Star Trek and we get Larry’s take on the current hot topic Star Trek Discovery. Larry worked on Star Trek Continues and we ask him about the two part finale and his involvement towards the end of Star Trek Continues. Before we let Larry go David asks for an update on the Con of Wrath Documentary. We had a fantastic time having Larry on the show and we hope you enjoy your weekly shot of Star Trek! This week we welcome Bonnie Moss and Dr. Trek AKA Larry Nemecek on the show to talk about this years Geek Nation Tour and Star Trek Las Vegas. First Larry gives us an update on Portal 47 and the Con of Wrath. Larry helps with the Star Trek Geek Nation Tour and Bonnie was a participant so it is is great hearing them tell us how all this went from both perspectives. The Star Trek Geek Nation Tour also leads up to Star Trek Las Vegas and we get the rundown on how it was this year for both of our guests! As is tradition we rabbit hole into other topics such as the 50th anniversary of star trek as well as some talk about the upcoming Star Trek Discovery. As we close Larry gives us some updates on Enterprise in space as well! It has been almost a year and a week since Leonard Nimoy passed. The cosplayer Scruffy Rebel did a photoshoot as a tribute to Leonard Nimoy and it inspired me to get an interview with her and others to remember Nimoy a year after his passing. In this episode I speak with, Victoria Schmidt (Scruffy Rebel), Kat Sky, Guy Davis, Fayth Hertzberg, Tawnya Holly, and Larry Nemecek to get their feelings and memories about Spock and Leonard Nimoy. So please join us for this memorial of thoughts to the Legend we will never forget Leonard Nimoy! On this week’s Synthaholics I am joined again by Lydia Sherrer this time as guest co-host! 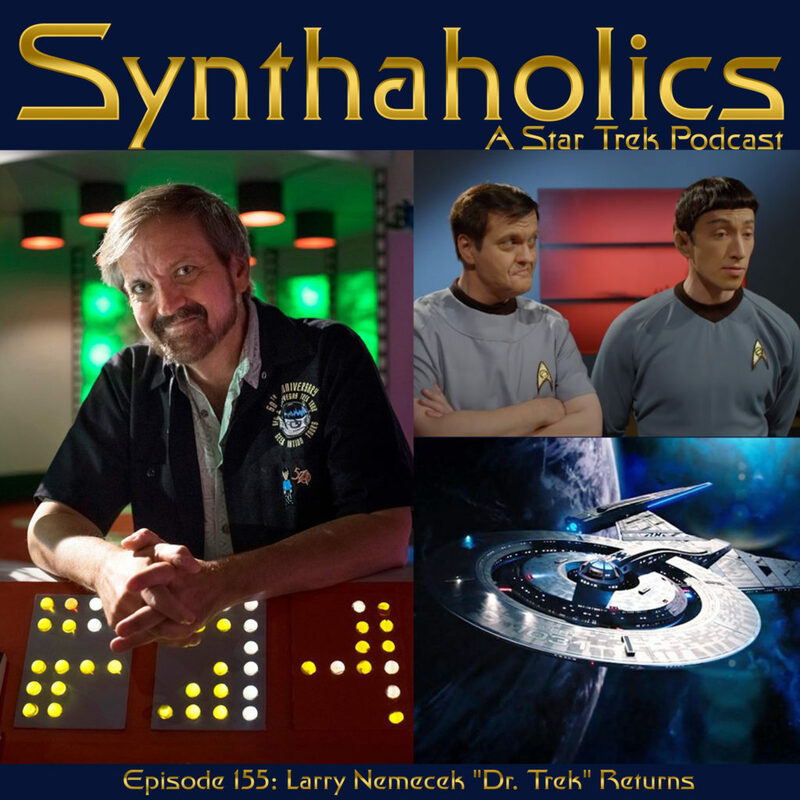 Together we welcome Dr. Trek himself the one, the only, Larry Nemecek back to the show. This week we get updated on his Portal 47(Www.Portal47.net) and we talk a great bit about Enterprise In Space (http://www.enterpriseinspace.org/). We talk some general science fiction movies and how they inspire love of space in general like the Enterprise in Space project! We also briefly touch on the new Star Trek series as well as some Enterprise questions. It’s our 50th Episode guys! I hope you have a lot to drink tonight because this is our first big milestone and we hope you’ll be here for our 100th! This is the new Sythaholics release date so look for future episodes on this day rather than Sunday! Please check out more of Larry’s links below. If you like the show please leave us a rating and review on either platform! 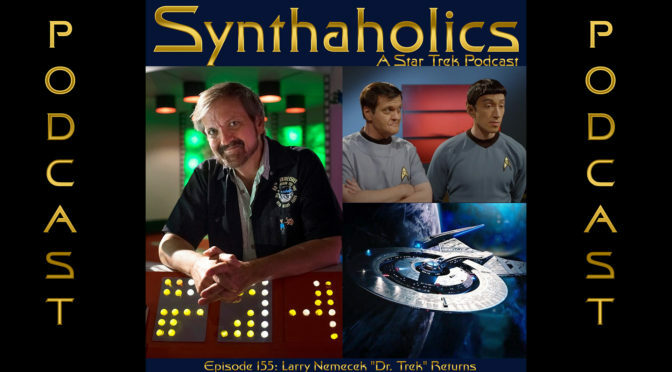 On this week’s Synthaholics we have the great Larry Nemecek (larrynemecek.com) join us. This week he was down in Houston working on his Con of Wrath documentary. (conofwrath.com) Larry speaks with us about this as well as other projects he is involved witch such as Enterprise In Space (http://www.enterpriseinspace.org/), Portal 47 (portal47.net), and Geek Nation Tours (geeknationtours.com). We ask Larry about how he got started in Trek, we also get his thoughts and insight on our episode this week, the Star Trek Voyager episode Mortal Coil. We had a fantastic time getting to talk with Larry and we hope you will enjoy hearing our discusion as much as we loved having it. See below for more links to learn more about what Larry is up to! Now it is time to grab a Synthahol, sit back and enjoy this weeks installment of Synthaholics!